Agent Ron Anderson confirmed Sunday that East Coast-based jockey Joel Rosario will shift his tack full-time to Santa Anita beginning Dec. 26, opening day of the track’s Winter Meet. Rosario, regarded as one of the strongest finishers in racing, comes off a huge weekend at Churchill Downs, beginning on Friday when he won both the Breeders’ Cup Juvenile and Juvenile Fillies with Bob Baffert’s Game Winner and the John Servis-trained Jaywalk, respectively. His crowning achievement came Saturday as he guided Accelerate to victory in the $6 million Breeders’ Cup Classic. 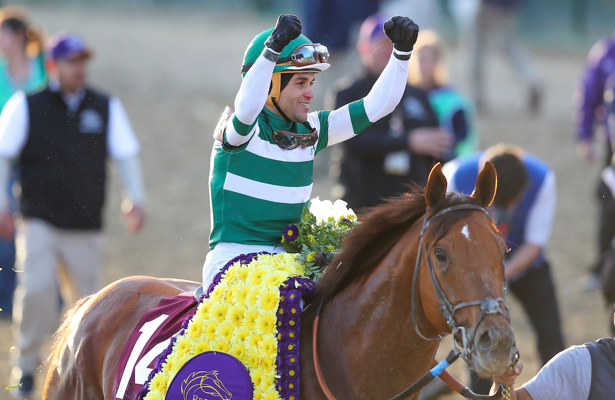 A winner of nine Breeders’ Cup races over his career, the 33-year-old native of the Dominican Republic completed a rare double in 2013 when he won the Dubai World Cup with the Graham Motion-trained Animal Kingdom and then won the Kentucky Derby with the Shug McGaughey-conditioned Orb. Among the top six money earning riders in America for nine consecutive years dating back to 2009, Rosario, who was formerly based in the San Francisco Bay area and here in Southern California, joined Hall of Famers Bill Shoemaker, Laffit Pincay, Jr. and Kent Desormeaux when he won six races in one day at Hollywood Park on Dec. 11, 2009.